CBS 2 Los Angeles. KCBS. 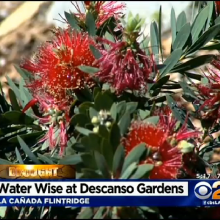 Adriana Weingold: Descanso Gardens introduced a demonstration garden Wednesday that is drought tolerant. 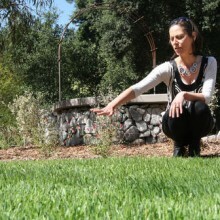 The low-water Center Circle Garden presents a new look for landscaping that thrives in both dry and rainy climates, officials explained. La Canada Valley Sun. April 8, 2015 4:34 p.m. By Sara Cardine: When it comes to using water in a period of statewide drought, La Cañadans are going to have to pay to play. That was the message handed down Tuesday by the State Water Control Resources Board, which determined communities grossly exceeding the California average of 77 gallons per person per day will be forced to make cuts beyond Gov. Jerry Brown’s recent 25% mandate, reducing their usage by as much as 35% in the coming months. KTLA. March 18, 2015: If you can’t enjoy the garden in person during the 2015 Theodore Payne Foundation Native Garden Tour, Gayle Anderson with KTLA’s video tour is the next best thing! 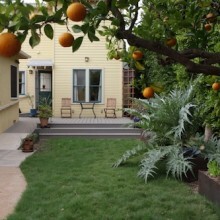 See vibrant native foliage, two distinctive IdealMow lawn alternatives, architecturally raised beds of edibles, as well as a biological pond, flowing permeable pathways and interlocking decks.